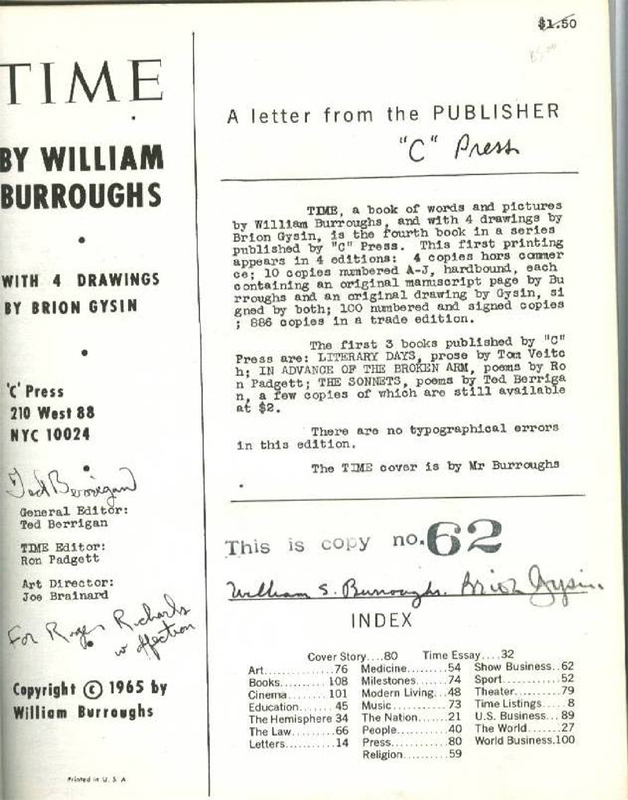 I know nothing of the study and verification of signatures and if anybody viewing this page does please e-mail me with information about the characteristics of Burroughs’ signature. That aside, below are five signatures dating from 1960 to 1995. Only one of the signatures that I have is dated. 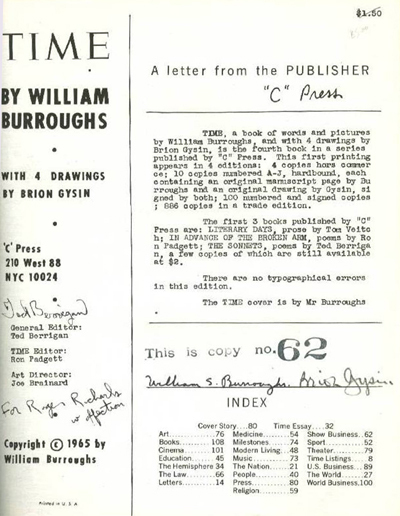 Yet given the publication date of the signed books and the presence of other signatures (such as those of Brion Gysin and Gregory Corso), it is possible to surmise the approximate date that Burroughs signed. 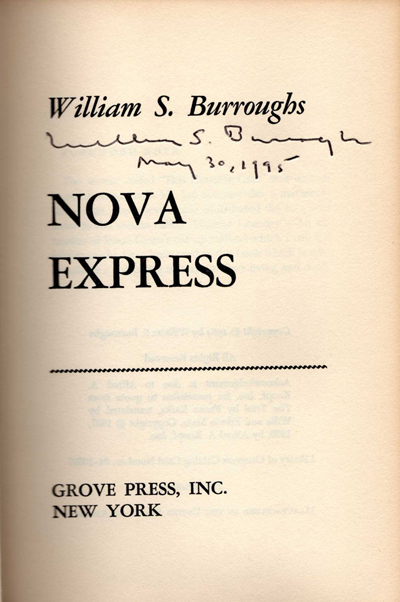 Given a set of 15 or so signatures, you can also see how Burroughs’ signature has changed over time. 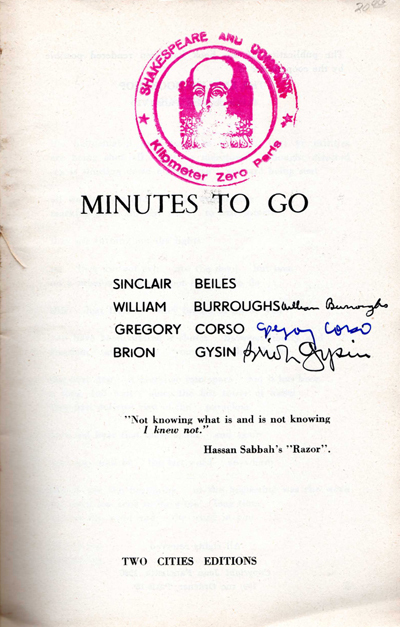 The first signature accompanies the Two Cities edition of Minutes to Go published in 1960. The copy that I have is also signed by Brion Gysin and Gregory Corso. Based on the fact that all three signed the book, I assume the book was signed shortly after publication — possibly at a book signing at Shakespeare & Co. in Paris. This assumption is supported by the fact that the signature is extremely tight. The compactness of this signature is exaggerated due to the fact that the space for the signature is small, but the distinct features of Burroughs’ hand are there. The W and the B rarely extend far above the rest of the signature. Notice also the loops in the lower left and lower right of the B. Here is another early signature in Dead Fingers Talk which is more representative of an early signature. The loops in the B are there as is a curl in the W. The signature is quite tight with a distinct slant to the right which is not noticeable in the Minutes to Go. The U is almost flat and melts into the G. This effect is also in the Minutes to Go. This signature is from Time accompanied by signatures of Brion Gysin and Ted Berrigan. It was signed as a limited edition of 100 in 1965. 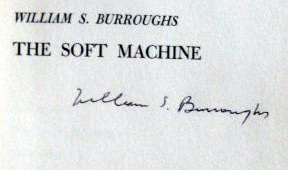 Although it is an early signature, it shows an increase in size which becomes more noticeable as Burroughs grew older. Unlike the previous ones, this signature also has the intial S. I do not know Burroughs’ practice with regard to his middle initial, such as when he started including it, but the later signatures seem to include it more often. The S is very distinctive like the rest of his capitals. The fourth signature comes from the Grove Press edition of The Soft Machine. I would guess that this was signed long after publication, possibly in the 1980s. The signature has gotten larger, longer, and looser. The letters have much more space between them, but the B and the UG remain distinctive. The final signature is from The Grove Press Nova Express and was signed in 1995, roughly two years before his death. This signature shows a pronounced loosening. 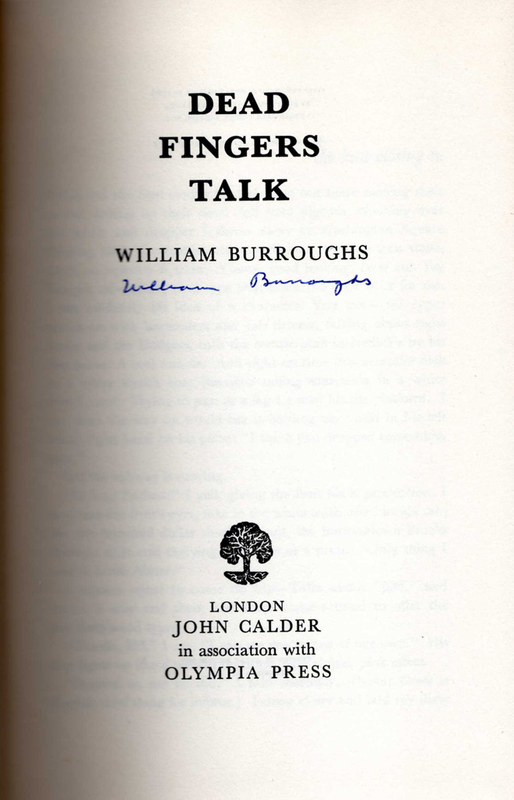 In addition, Burroughs pressed upon the page much harder as he grew older. In this case, the next page has an imprint of the signature. The B still has a slight loop and the W has its curl. Notice how over time the S at the end of Burroughs opens up and eventually disappears. There is also a date with the signature which is unusual (in fact the only signature I have with a date). Written by Jed Birmingham and first published on his now defunct personal site. Republished by RealityStudio on 14 November 2008. Also see Buyer Beware and Time.